Take a family wildflower hike at Ring Mountain Open Space Preserve in Tiburon. Here are our picks for great events and activities for children and families this weekend. Find more events for the whole week in Marin and throughout the Bay Area in our Family Events Calendar. Starting this Friday, they will be hosting Open Play times for children to experience their space outside of regularly scheduled classes. Children will have access to educational, sustainable toys, not within a structured activity, but as a time for them to just play, using their creativity and imagination. Admission is $12, the good news is that the full amount is applied to your account as a credit (Cucu's Cash) to purchase toys from the store. Registration is strongly recommended as space is limited. You can register here. Location: 1414 4th Street, Downtown San Rafael. Event details. Bring your little one in for toddler-specific facilitated experiences. We'll bring out activities like mad mattr, bubber, oobleck, and other sensory exploration activities for your little one to hone their sensory exploration skills. Museum admission applies. Location: 1835 W. Steele Lane, Santa Rosa. Event details. Join us for stories and songs for all ages at our newest storytime! Stay afterwards to play with toys provided by the library. Children must be accompanied by an adult for entire session. Free. Location: 1501 Tiburon Blvd., Tiburon. Event details. Meet us at the Mart this Friday night to enjoy some jazzy tunes on the Belcampo Patio! Grab some butcher snacks & a drink and settle in for a musical adventure furnished by Pamela Rose! Free. Location: Larkspur Landing. Event details. Marin County Parks is offering free access to all parks on the first Saturday of the month all year long! Includes Black Point Boat Launch, McInnis Park, McNears Beach Park, Miller Boat Launch, Paradise Beach Park, and Stafford Lake Park. Event details. Bank of America cardholders can visit the following Bay Area museums for free! Enjoy the Contemporary Jewish Museum, de Young Museum, the Legion of Honor, and the Chabot Space and Science Center. Photo ID and a valid Bank of America/Merrill Lynch credit or debit card must be presented. Event details. Join the frolic as we celebrate joyful, new life with all the baby animals and renewal in the garden. Bottle feed the goat kids. Pet the soft fleece of young lambs. Feel the golden fuzz of young chicks. Participate in garden projects, cooking and crafts. Cost: Fee: $35 per person, children 35 months and under are complimentary but you must register for a free ticket. This event is currently sold out, please join the waitlist here. Location: 2025 Shoreline Hwy., Muir Beach. Event details. Bring your family for an exploration of spring! In an effort to improve the health and wellness of all Bay Area residents, explore the natural and cultural history of the Marin Headlands on an engaging naturalist led hike! Learn about the plants, animals, minerals and people that have inhabited this national park. Free, but registration required. Location: 981 Fort Barry, Marin Headlands, Sausalito. Event details. Touch-A-Truck® is a family-friendly event for children to Explore, Climb & Touch trucks of all shapes and sizes. From exploring cars and trucks, to playing carnival games and visiting the petting zoo, a variety of children's activities will keep everybody busy and active. Hosted by the Junior League of San Francisco. Tickets start at $12 for children. Purchase tickets here. Location: The Presidio Civil Way Lawn, San Francisco. Event details. When Julia's beloved fuzzy friend Fluffster goes missing, everyone works together to find him, and by the end it is clear that when "family and friends stick together," everyone is happy! Storytime and activities. Location: The Town Center Corte Madera. Event details. Spend a day by the Bay listening to music, taking free sailboat and Dragon boat rides, eating tasty food, and exploring the Berkeley Marina. Visit booths sponsored by fun and educational organizations from throughout the Bay Area to learn about exciting things you and your family can do locally. Pick up a Passport to the Bay and get it stamped as you move from activity to activity in each booth. Education, entertainment, and fun for all ages! Event details. Paint, draw, doodle and decorate! Kids will have fun decorating and personalizing their own garden box and will learn the skills to earn their own “green thumb”. Rangers will assist with planting and selecting the right seeds for your box. This event is ideal for ages 5 and up though all skill levels are welcome, and no experience is necessary. We’ll provide supplies and healthy snacks. No pets (except service animals) are allowed at this park. Rain doesn’t cancel the event. Please reserve your spot in advance. 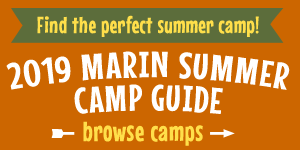 Questions or to RSVP: Contact Ranger Michael Campos at MCampos@marincounty.org. Park entrance is waived for participants. Location: 201 Cantera Way, San Rafael. Event details. Join Alice, the Mad Hatter, the March Hare, and the Dormouse for a whimsical Wonderland tea party at Falkirk in San Rafael! Enjoy tea sandwiches, beverages, and dessert while the costumed company of characters from the Stark Ravens Historical Players entertain with madcap comedy and antics. Falkirk’s beautiful and elegant Victorian setting is the perfect place for this fanciful spring tea party. There will be two seatings for this one-of-a-kind tea party at noon and 3 pm each day. Tickets: $27.50 adults, $22.50 children, $48 adult and child. Admission includes food and a goodie bag for each child. Bring your camera, for photo opportunities will abound! Reservations required. Event details. During Open Houses we offer free introductory sailboat rides to the general public aboard our fleet of keelboats and dinghies. Children must be at least 5 years of age and accompanied by an adult. Please try to arrive early as, depending on the conditions and the amount of people, the sign-up/rides may end before 4 pm.Come on down and get out on the bay! Event details. Drop the kiddos ( K-8 th grade) for some indoor fun. They can run, jump and play in an open gymnastics environment. Bring the kids in on a rainy day or any day to burn some energy. Cost: $30/ per child. Location: 70 Digital Drive, Suite #3 in Novato. Event details. Learn to ride pump tracks and rollers with a ranger. This event is ideal for ages 5 and up though riders of all ages are welcome. All skill levels–no experience necessary. Dress in layers and wear sturdy shoes. Don’t forget to bring your bike, helmet, and pads. Park entrance is waived for participants. Event details. Songs & Movement for babies, kids & families! Come a few minutes early to make an egg shaker that you can take home! Active rain or wet ground will cancel this event. Check back here morning of if unsure. Location: 2200 Novato Blvd., Novato. Event details. Bring the family for a day of music. Features concerts, workshops, kids acitivities and more. Free. Location: 2020 Addison Street, Berkeley. Event details. Unique Derique hops over the bridge to The Marsh San Francisco for an encore run of Fool La La: Over the Rainbow — and that’s no April foolin’! The Clown Prince of Fools keeps the fun going in this jolly circus-inspired celebration for all ages. Combining classic physical comedy, playful percussion, and electronic body music in a colorful clownucopia of delights, this hippity-hop, non-stop, over-the-rainbow romp includes “The Five Fool La La’s,” a delightful new video honoring five generations of family fun! After the show, get into the act and join Unique Derique in a free juggling and Hambone workshop for the whole family and discover your own Fool La La FUN! Tickets: $15–$100. Event details. Stinky Tales with Doug Zesiger: "Storytelling bringing big laughs while teaching empathy and confidence to 3-6 year olds." Join us for a morning of storytelling, food, fun and fundraising. Doug Zesiger and his puppet friends will be telling stories and weaving magic for a family audience. We'll be raffling off a live storytelling event by Doug and the puppets: a Stinky Tales playdate! Bring your kiddos and let’s curl up to hear some sweet Stinky Tales together. General Admission Adults $20/Children $12 (plus fees). Purchase tickets here. Location: 19 Corte Madera Avenue, Mill Valley. Event details.